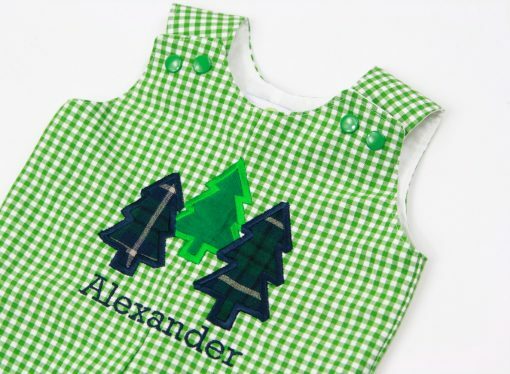 Our woodland boys outfit is great for wearing all winter long- the trees can be both Christmas trees or trees found in nature to make it versatile enough for all season long. The green gingham fabric is appliqued with 3 plaid trees and can be monogrammed with a name underneath for a personal touch. These outfits are perfect for special occasions holiday events, but easy and comfortable enough to wear every day. The fabric is 100% cotton cotton gingham. Our longalls are sturdy and comfortable to wear and move around in. We only use the highest quality fabric that will last a long time and through a lot of wear and tear. They’re fully lined in white fabric (or order yours to be reversible). The legs have snaps for easy diaper changes. Snaps are at the shoulders for an easy on and off. Our outfits are also completely machine washable and dryer safe- so you can wear without worry! 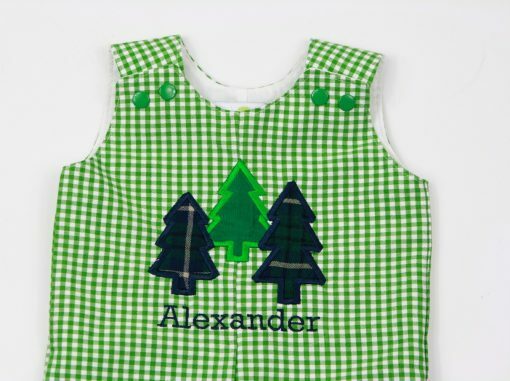 OPTIONS: You can order the outfit to have the trees applique, or add a name, or initials. The thread color and font you select would be for the name or initials embroidered on the outfit. To get the outfit unpersonalized, select none for thread and font.